Kate Rentz has been supporting the children and the people of the Santo Domingo, for over 10 years. 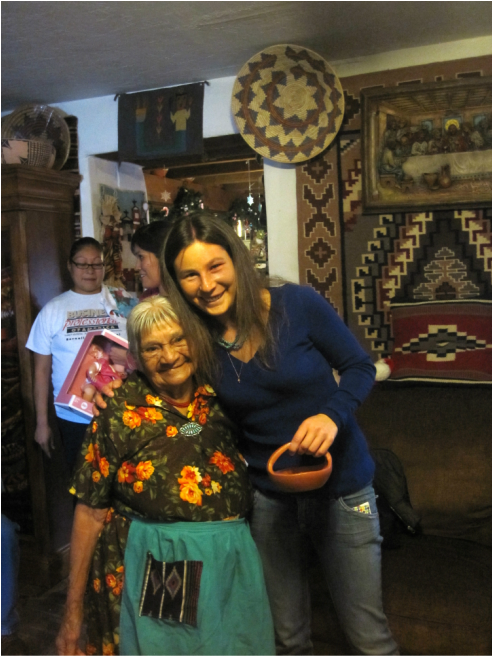 Her love for the culture, the people, and the communities of all pueblo's in New Mexico, is fuel that drives this organization. Children of the Pueblo is on a mission to help preserve and secure the culture, art, language, and tradition, in as many pueblo's as we can reach. This organization began, simply raising money to deliver needed supplies during holiday seasons; winter jackets, art supplies and books for elementary and middle school students, gift cards to nearby grocery stores for families most in need, etc. Today, we raise money to put towards school supplies, education for youth to practice tradition art, in order to keep the most important part of their culture alive - forever. We are always notified, and are constantly supporting the need for backpacks, books, winter jackets, art supplies, food, diapers for mother's, etc. Kate and Jolene's mother, Anita (Jolene's grandmother), visiting and exchanging holiday cheer a few days before Christmas. Children of the Pueblo is a small non-profit that receives no funding from the US Government. Your donations allow us to provide fundamental support to hundreds of Native American children, elders, and families. Join us and help deliver holiday cheer to the Children of the Pueblo!